Fabric flowers are a great way to use up scraps and you can use them to embellish just about anything. Since I'm such a hippie...well my husband says so...I decided to make some flowers for my hair out of my Dear Stella fat quarter bundle. 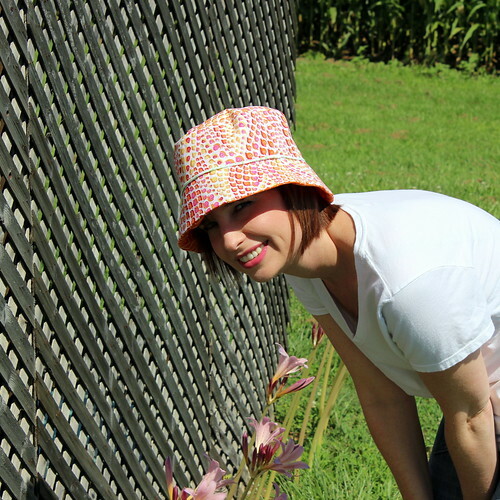 There are tons of ways to make fabric flowers. I prefer these rolled ones because they are quick and easy. There are some good tutorials are here and here. For my headband I bought some cheapies at the dollar store. 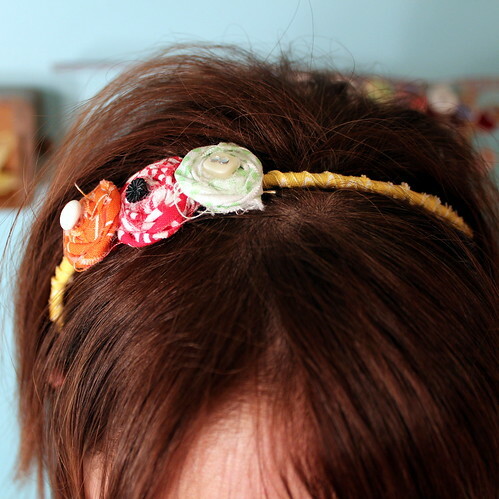 I cut a 1 inch strip of fabric and twisted around the headband securing with a glue gun. I then placed my fabric flowers where I wanted securing with a hot glue gun. I secured the bottom of the flowers to the headband with scrap felt. 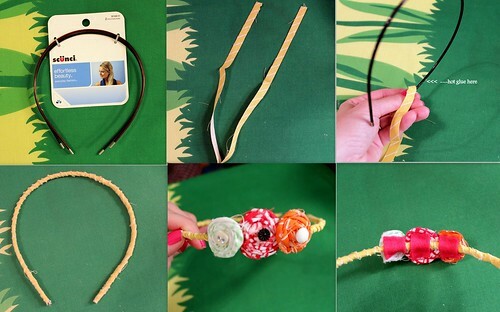 An easy way to jazz up a boring old headband. 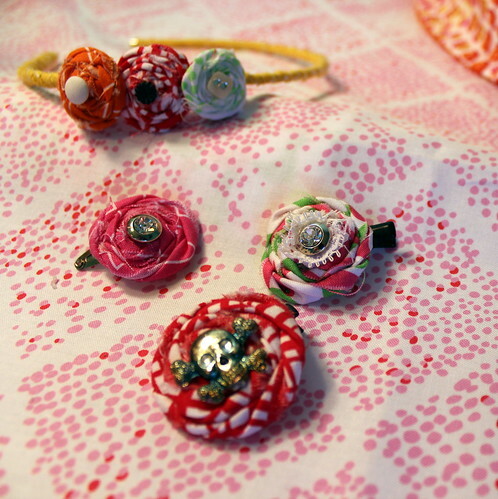 I also embellished some hair clips and claws with fabric flowers. The hair claws can even double as a pin on a lapel. 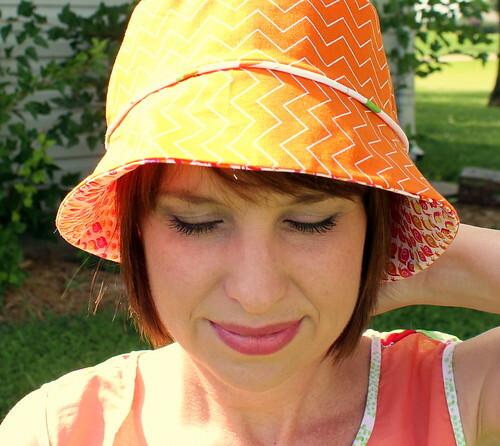 Another accessory project I made for my Dear Stella/Kollabora challenge was a reversible bucket hat. I found a free pattern here. I slightly altered the pattern by shortening the sides a smidge, about 1/2 inch. I also made my own piping. I just love the snail print! 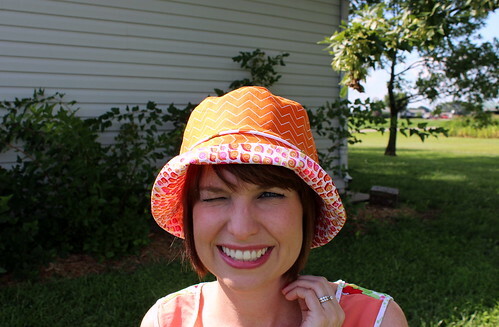 Maybe if you can't see because of the sun you should put your brim down! doh! I'm not much of a hat person but I really like the way this turned out. I thought it would be nice to wear when I'm working out in the yard. I always feel hats look goofy on me. Are you a hat person? I've got one last final project to submit to Kollabora. Nothing like waiting until the last minute, it's due tomorrow!! Blog post will have to wait until tomorrow. I gotta go catch some zzzz's. Nite y'all! Oooo flower broach I will have to jump on that idea for my small scraps. I'm liking the hat, it looks cute on you, not goofy at all. I'm a total hat person no need for a wedding or a day at the horse races to don a hat. I love your hat! If that's goofy, then it's definitely good-goofy. 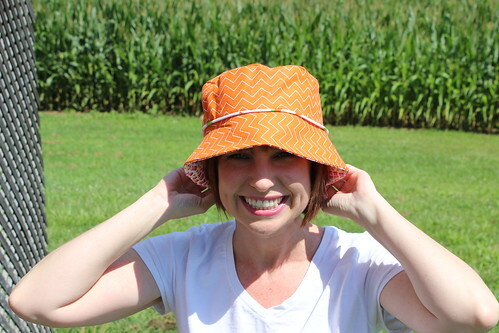 You should become a hat person - it looks great on you! Not goofy at all! You look gorgeous in your hat! It really suits you! I would think a hat would be really difficult to make! Was it? So cute! I really want to make some fabric flowers now and stick them everywhere! Thank you! No really it wasn't too bad at all. The hardest part was sewing the circle top onto the sides. I really like the hat! It's really cute- and does suit you! Cute hat! It looks great on you! 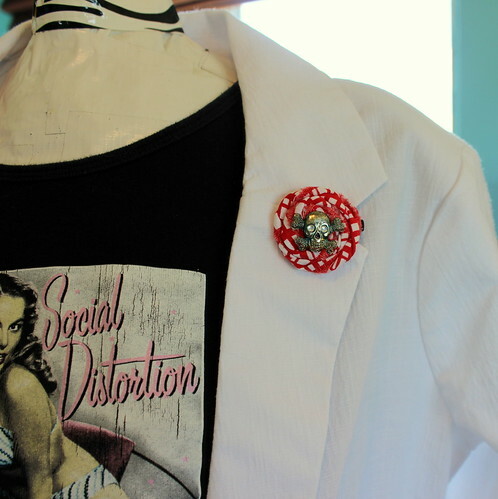 (I am a hat person)... And the skull flower lapel pin! Awesome! I also like the headbands but unfortunately husband doesn't like them on me...boo. That's ok because I don't like camo on him and he obliges! Colette Sorbetto and George needs your vote!